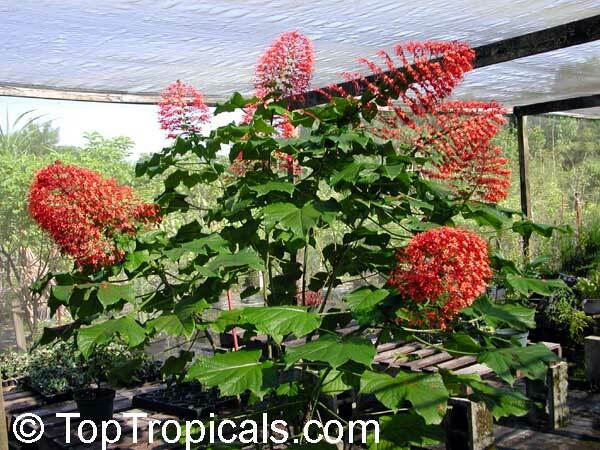 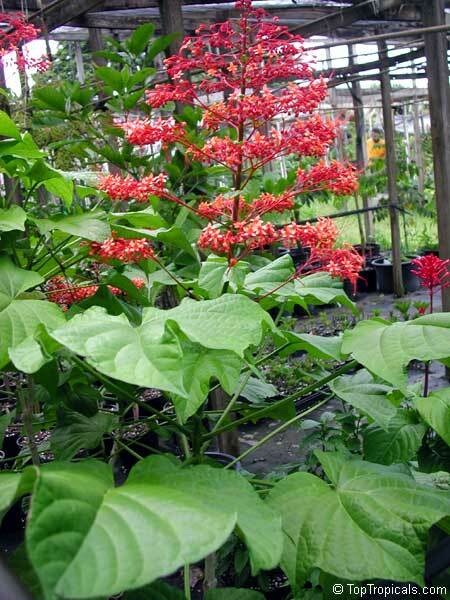 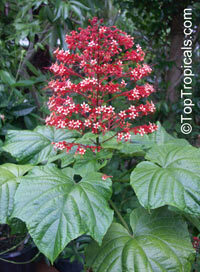 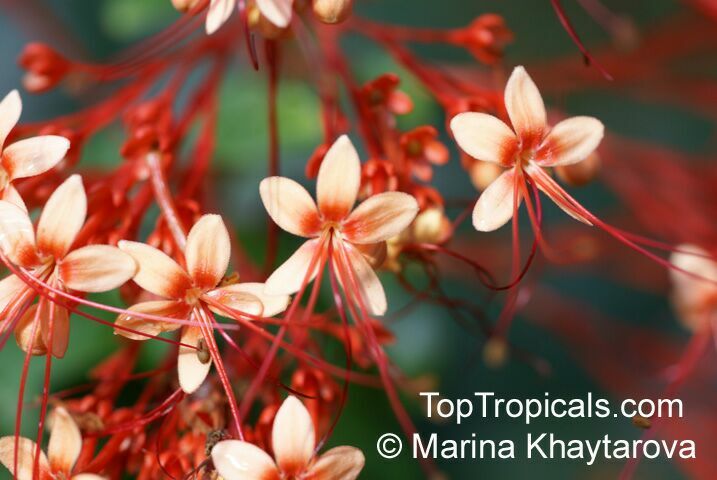 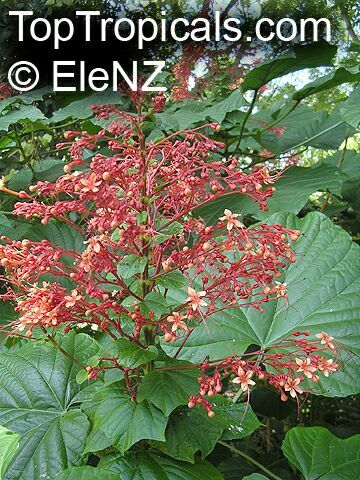 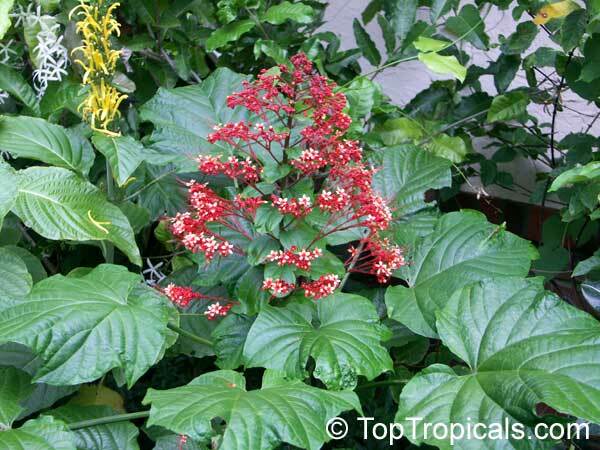 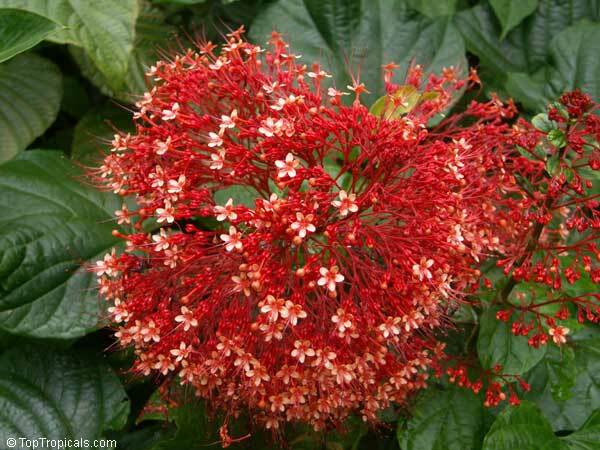 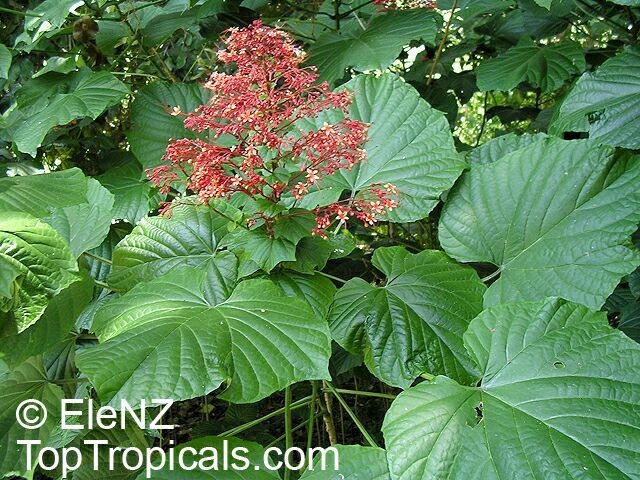 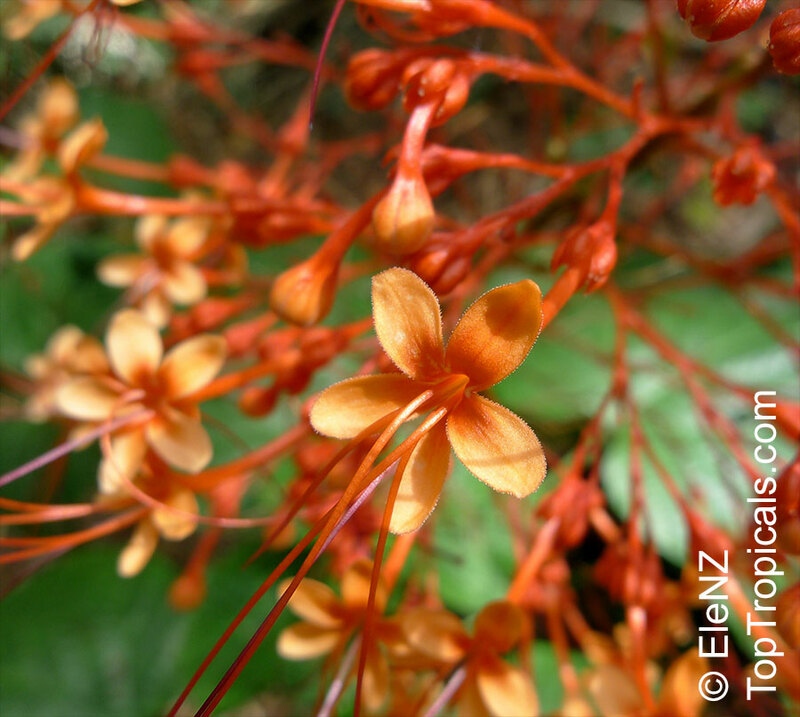 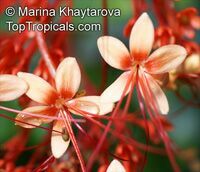 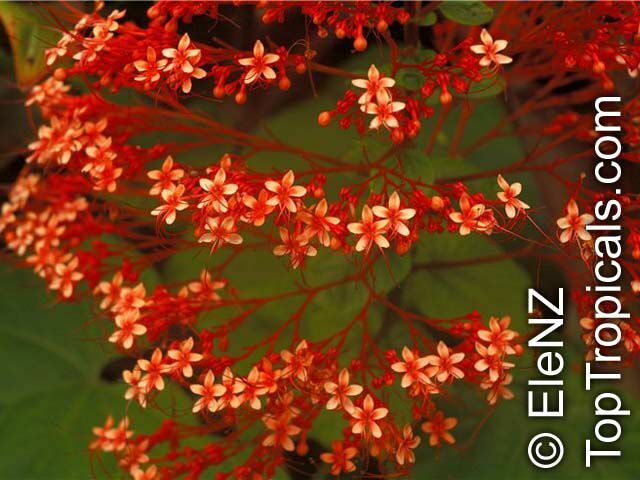 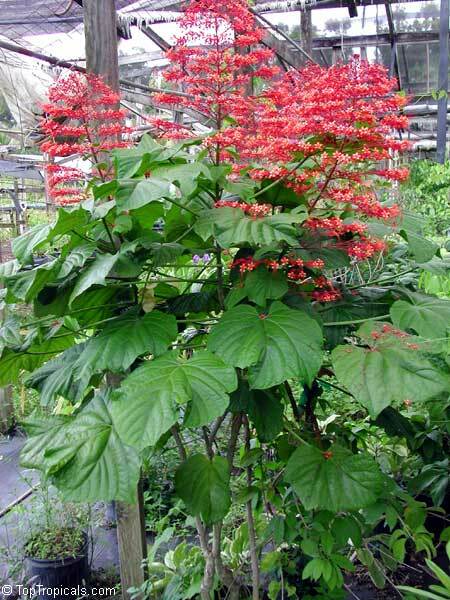 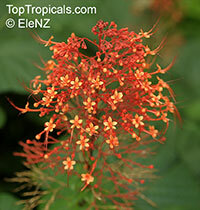 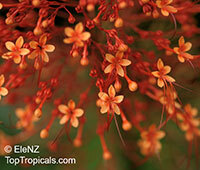 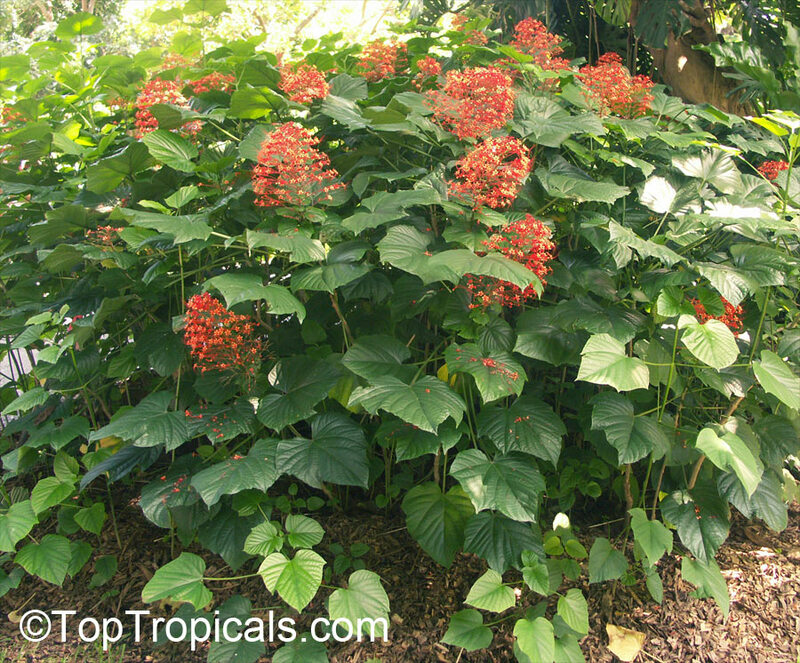 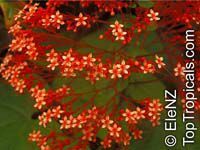 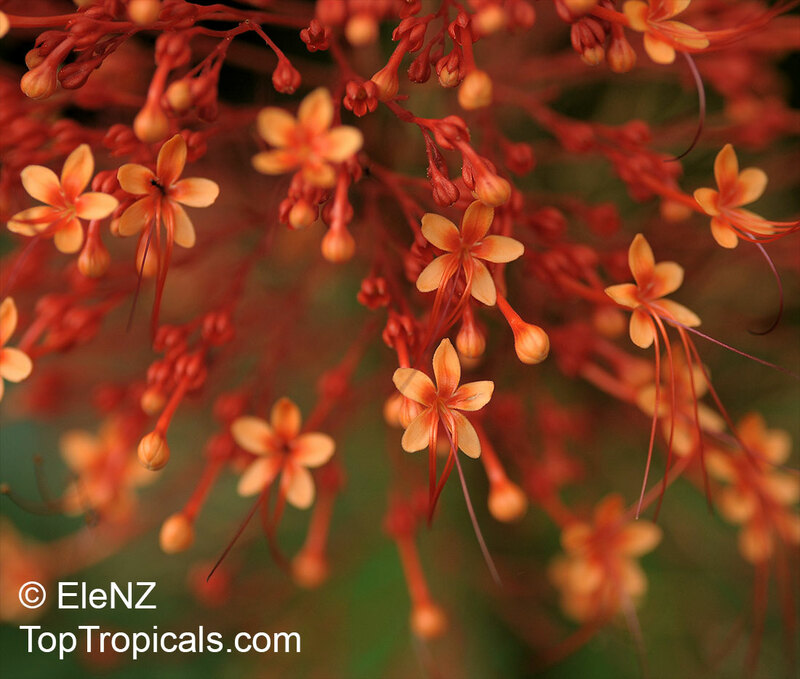 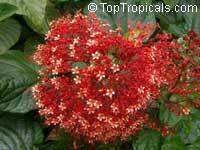 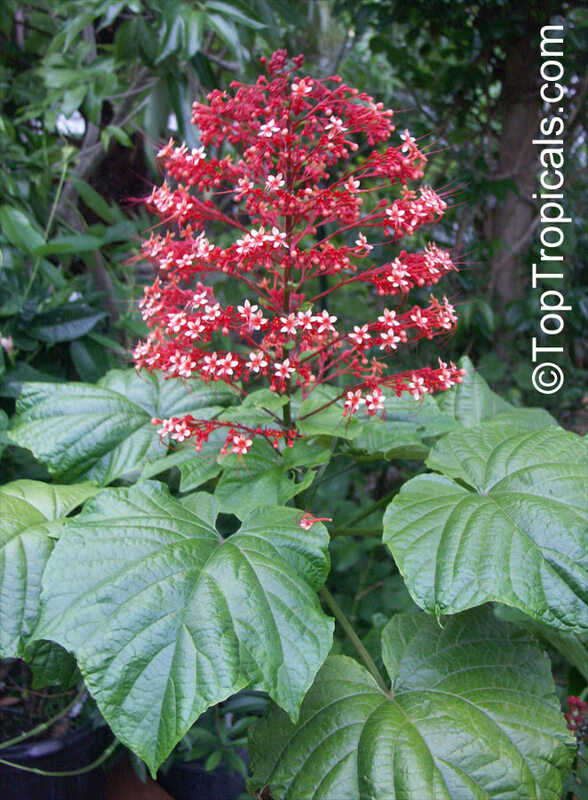 This is an erect, open semiwoody shrub with large evergreen leaves and huge showy clusters of orange-red or scarlet flowers held above the foliage. 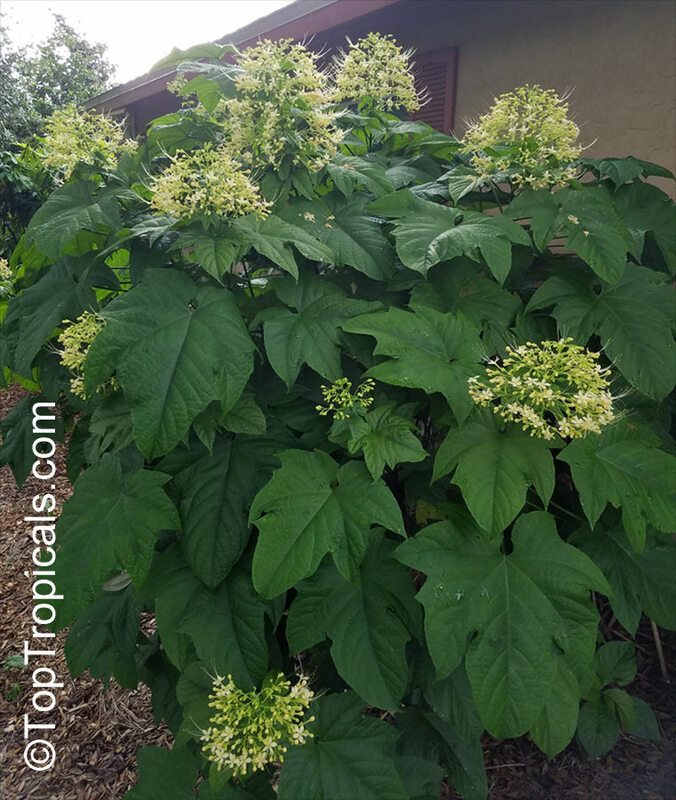 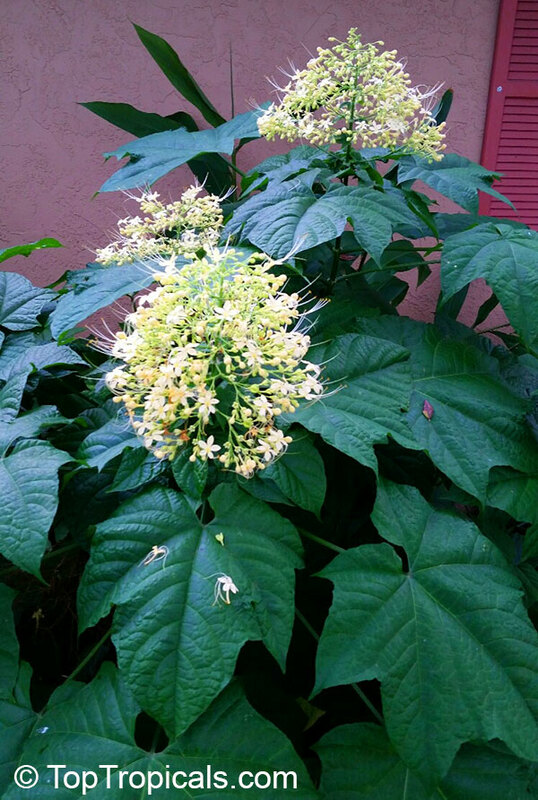 The bush sometimes has multiple stems and gets 3-5 ft tall, spreading 2-3 ft across. 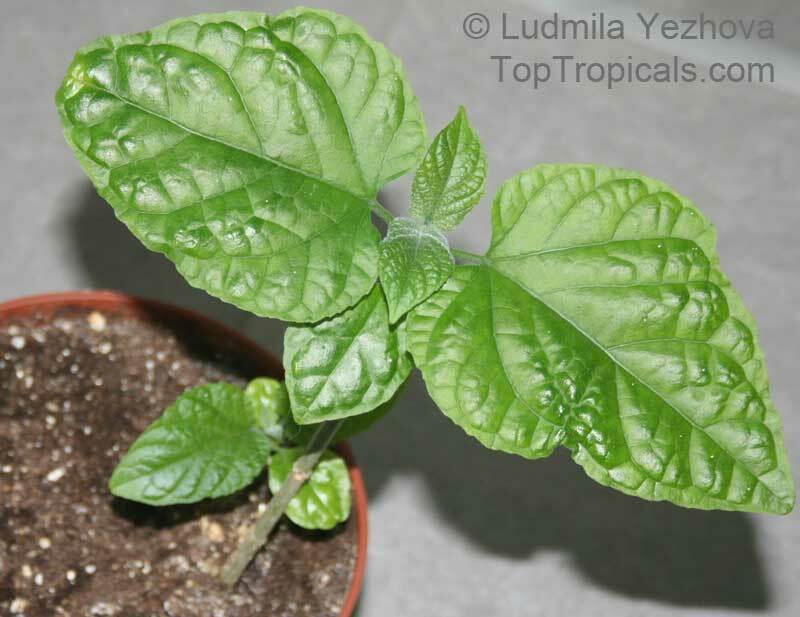 The handsome, tropical looking leaves can be as large as 12 in across, they have heart shaped bases; lower leaves are lobed and upper leaves entire. 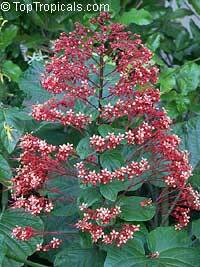 They are arranged in opposite pairs along the fast growing stems which often branch from the roots rather than from a single trunk. 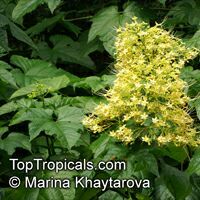 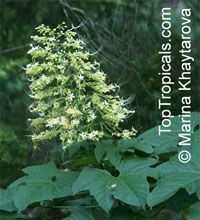 The flowers are funnel shaped with long tubes. The flowers within the pyramid shaped cluster are tiered, like a Japanese pagoda. 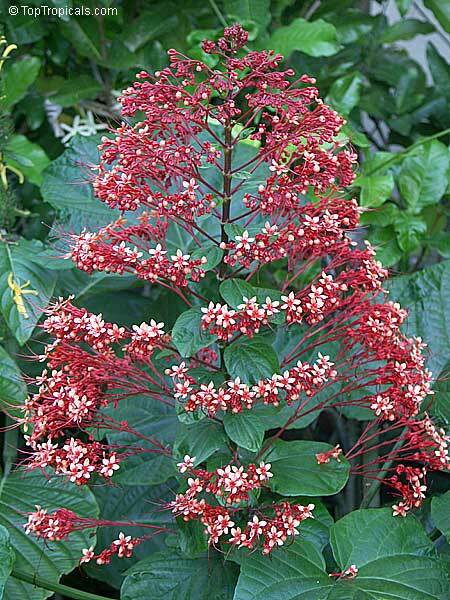 The showy display lasts from summer through autumn with additional sporadic flowering throughout the year in frost free climates. 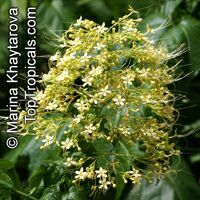 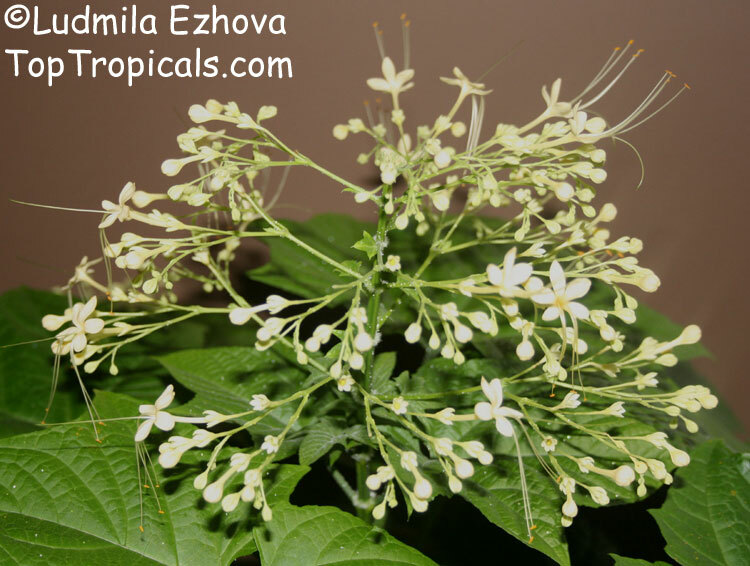 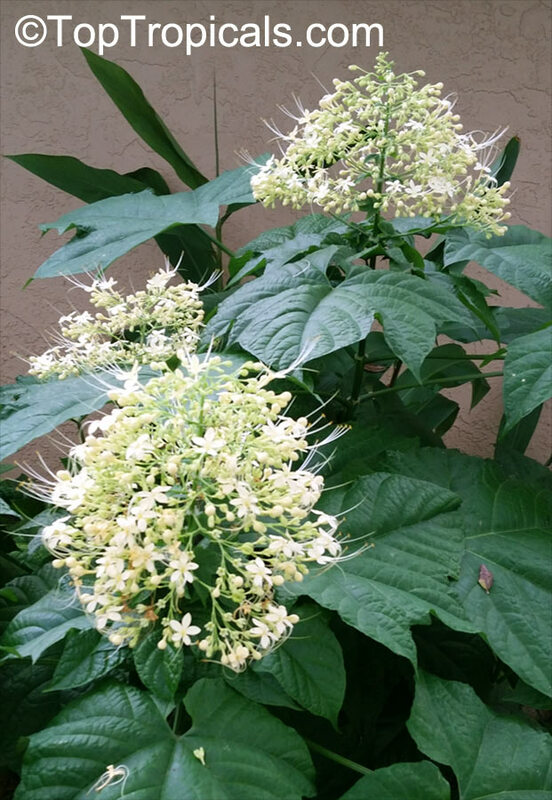 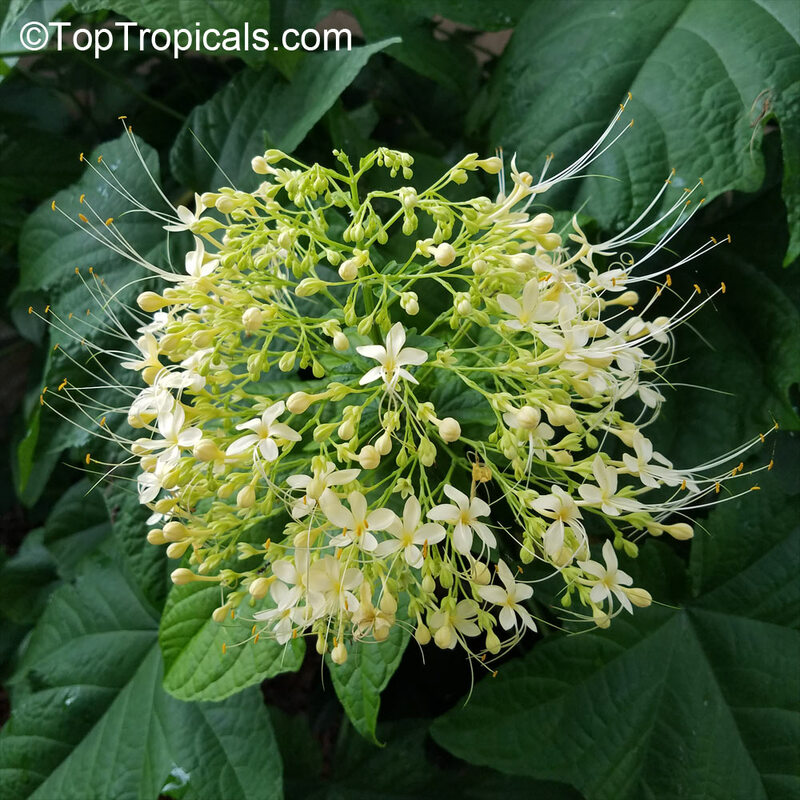 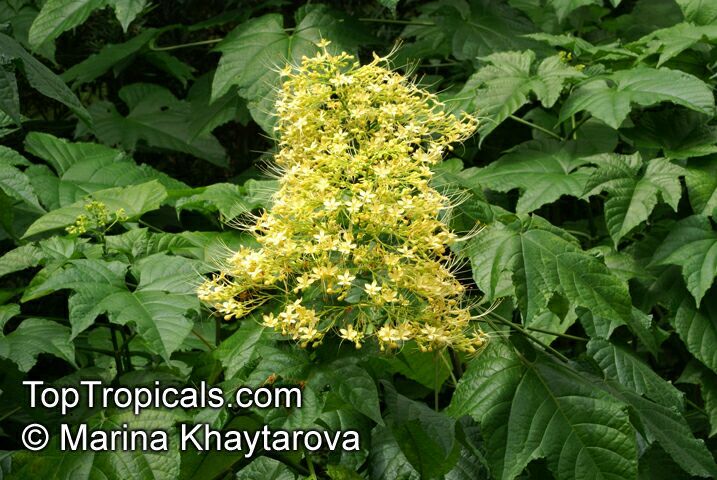 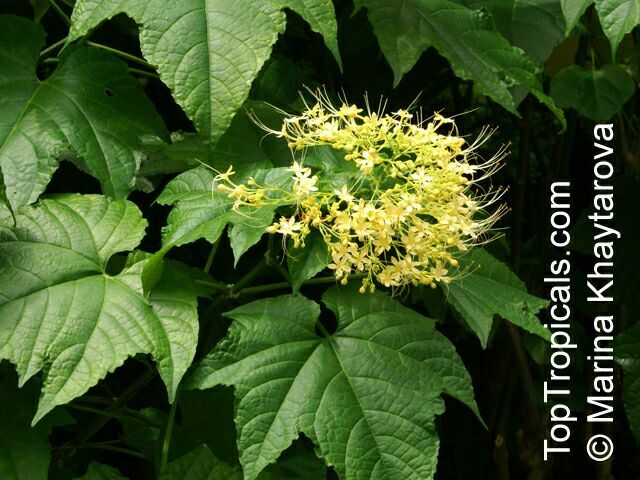 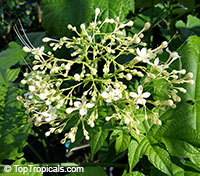 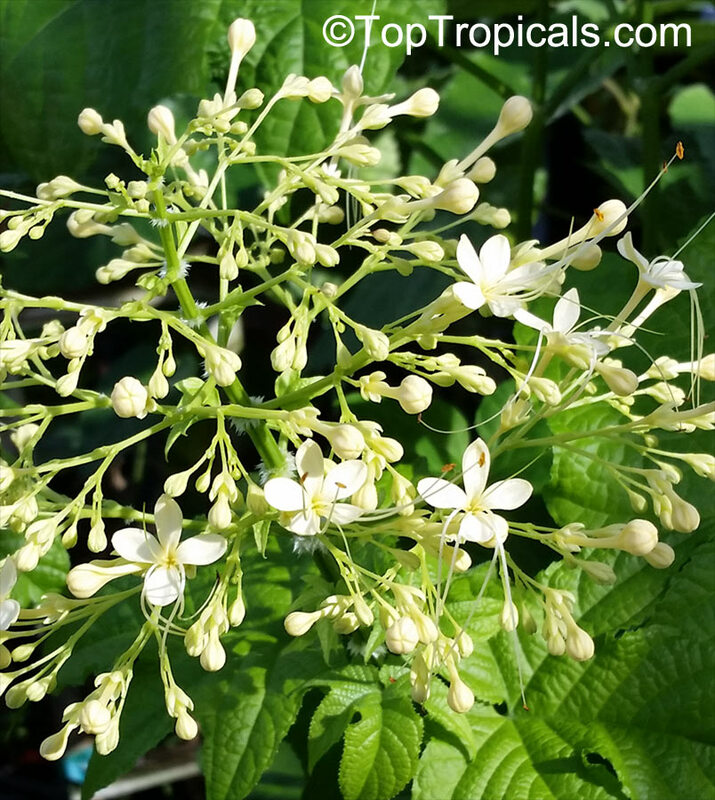 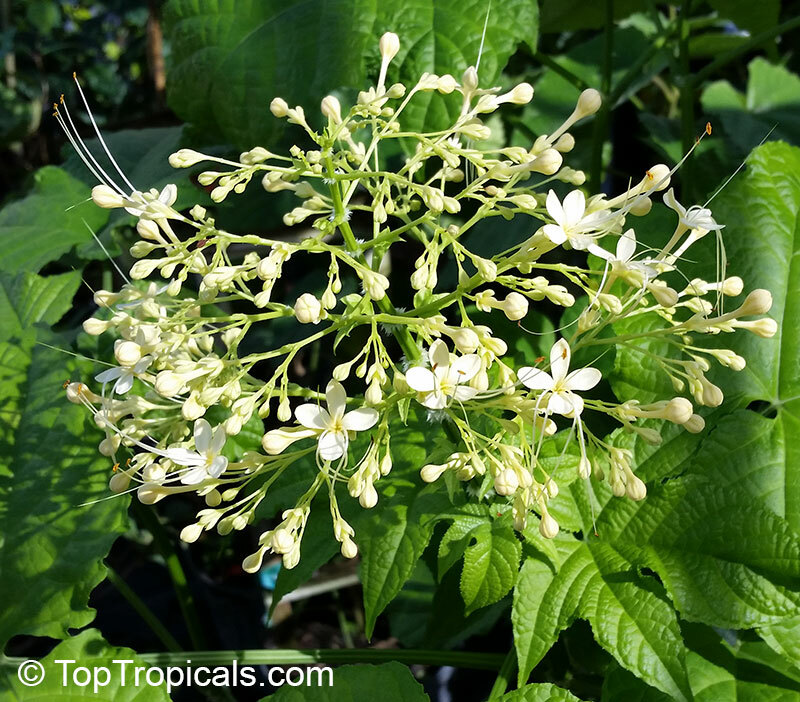 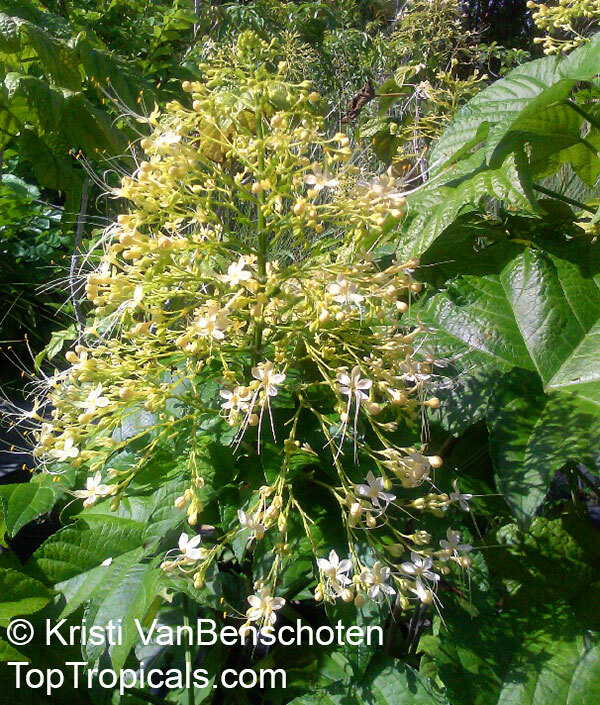 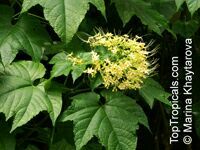 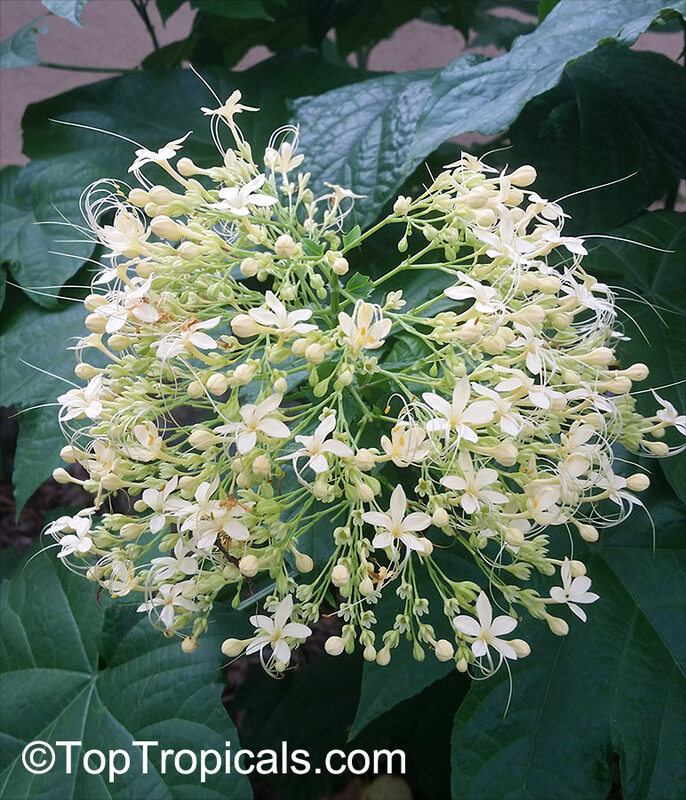 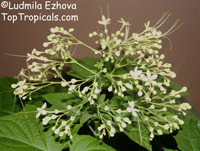 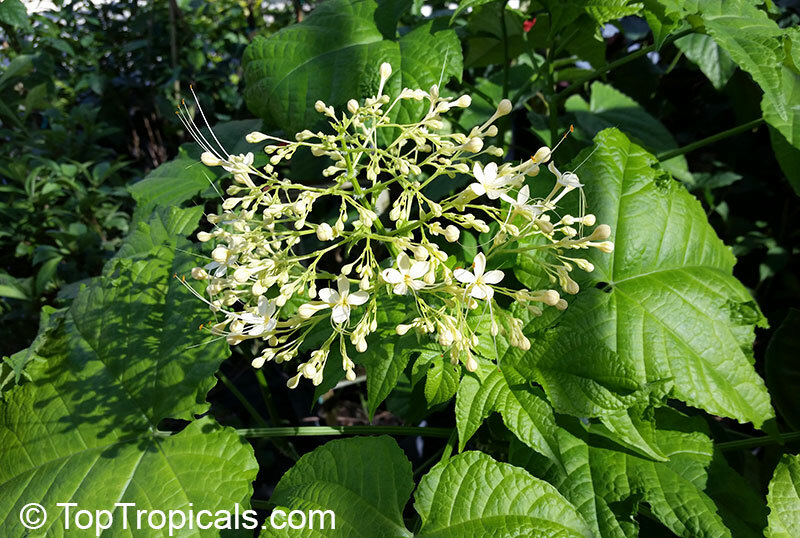 Pagoda flower is a fast growing shrub. 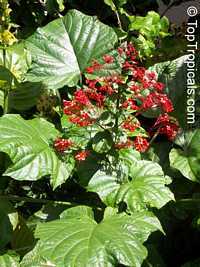 It does best in a rich, slightly moisture retentive soil. 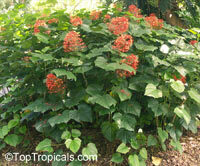 Hardiness: USDA Zones 8 - 11, a returning perennial in zones 8B and 9. 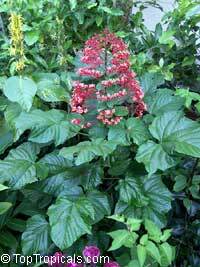 It can be expected to sprout back in spring after dying to the ground in winter. The plant is often grown in a mixed border or as a specimen along a wall, even under an overhanging roof. 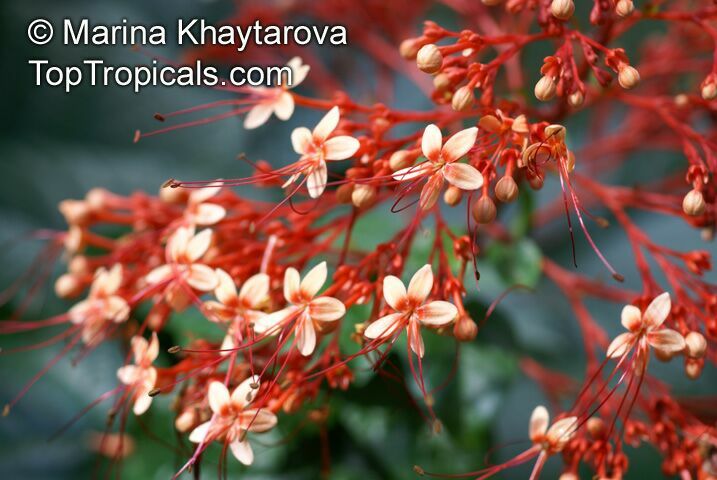 Pagoda Flower, Orange Tower Flower. The flowers within the pyramid shaped cluster are tiered, like a Japanese pagoda. 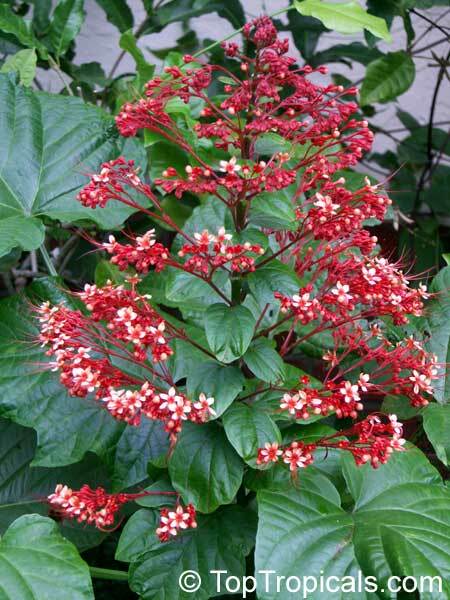 Very showy landscape shrub. Yellow Pagoda Flower. 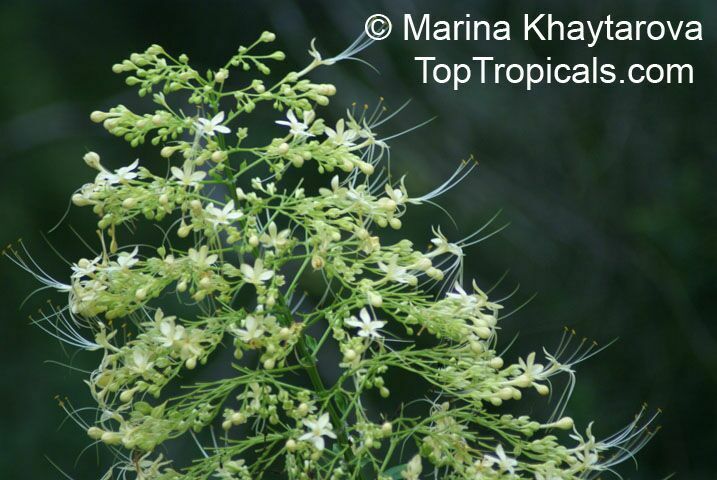 Rare variety with off-white to yellow flowers. 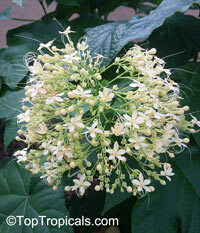 The flowers within the pyramid shaped cluster are tiered, like a Japanese pagoda. Very showy landscape shrub. 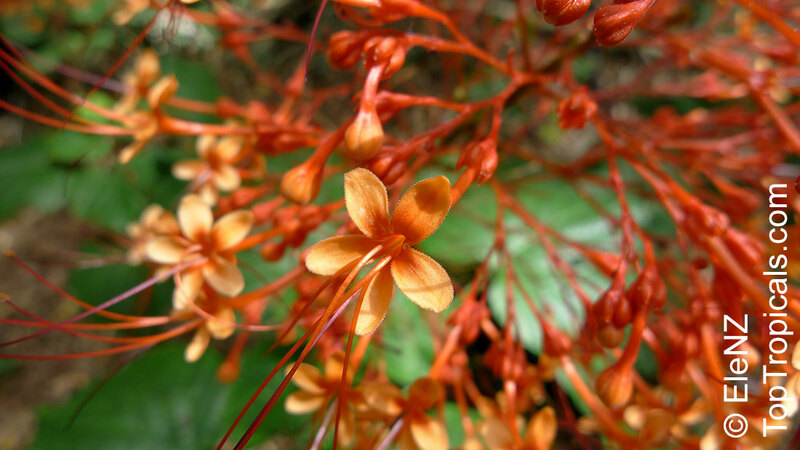 Pagoda Flower. 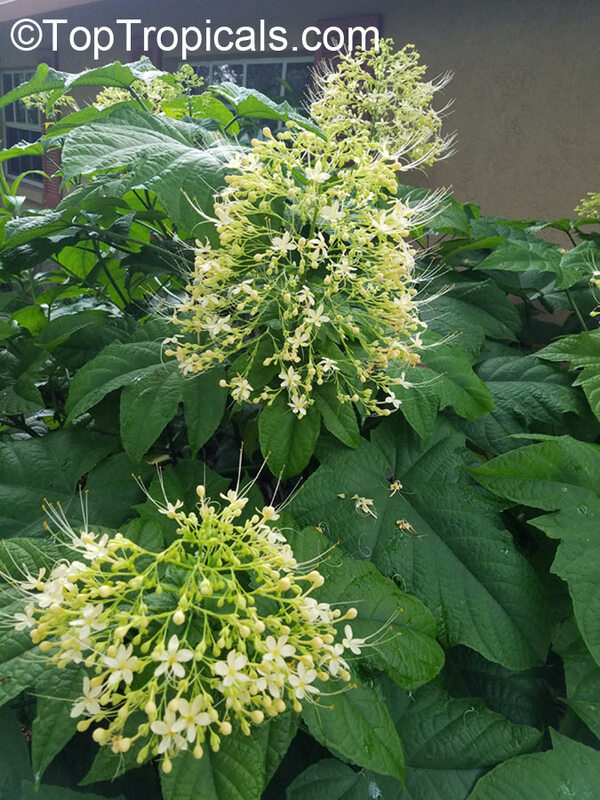 Rare variety with off-white to yellow flowers. 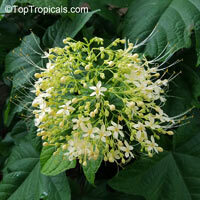 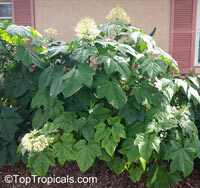 This rare variety with off-white to yellow flowers is one of the most impressive flowers of Florida winter season. We have this plant growing in our frond yard under the oak, in shade, and it keeps blooming all winter long! 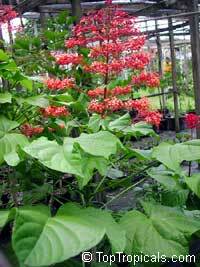 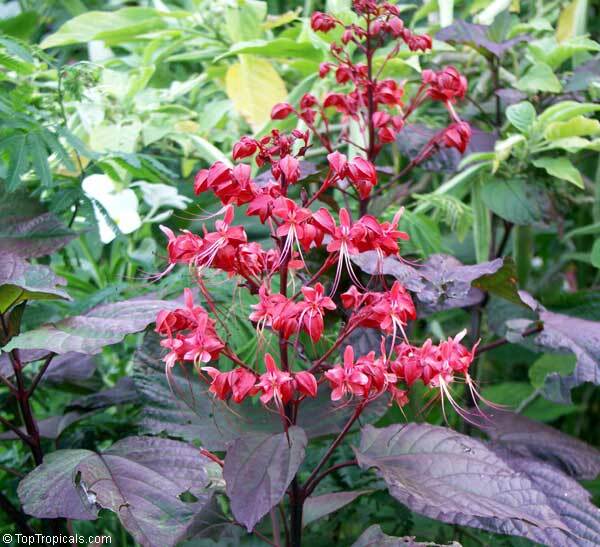 This variety seem to be hardier and more vigorous than regular red variety. 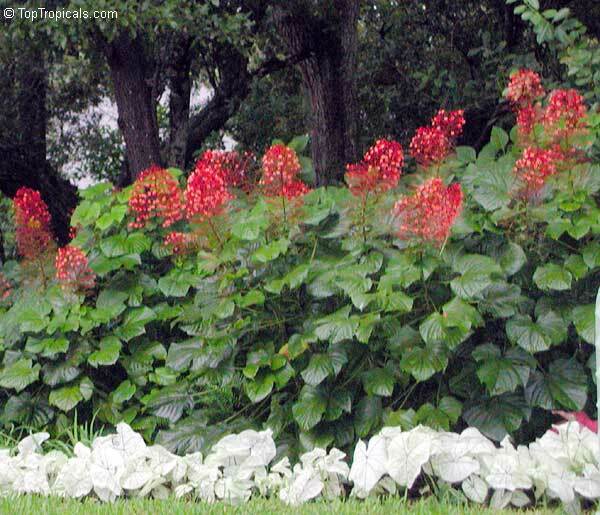 It is also very drought tolerant, we never water it! 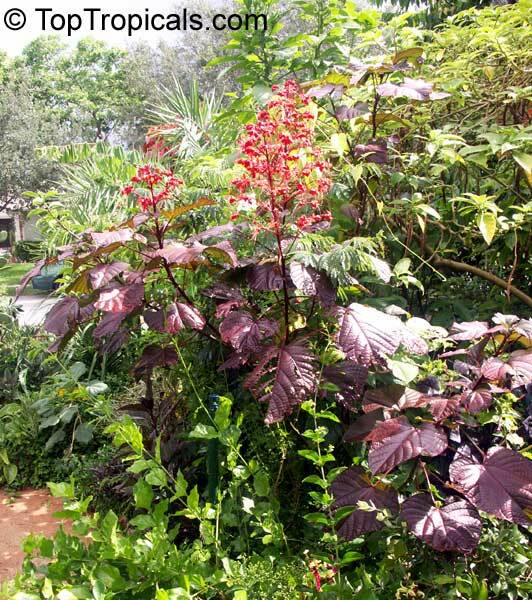 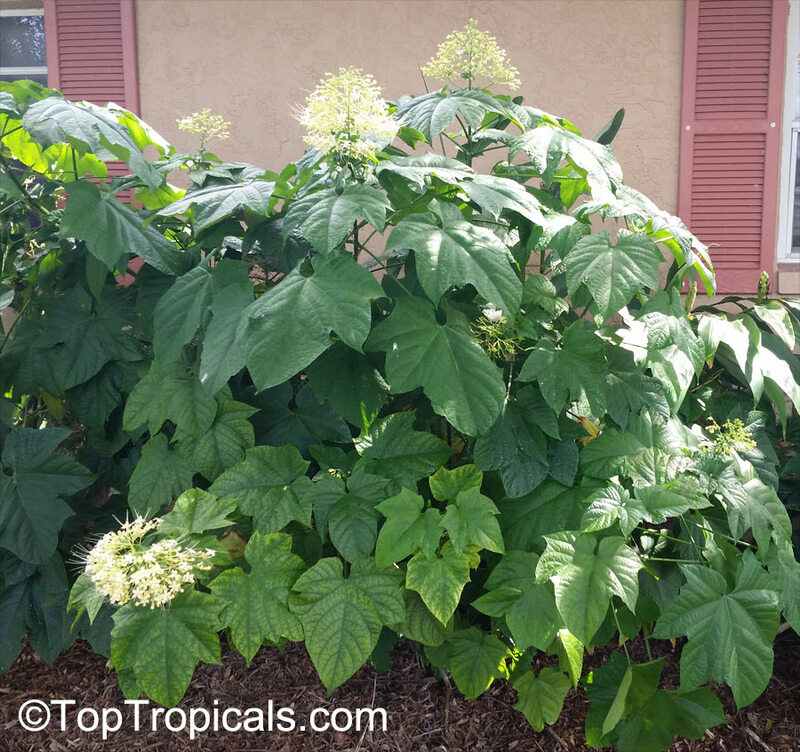 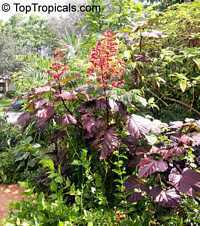 The plant produces lots of root suckers so it spreads with time, but this is the great feature for the location: it covered an ugly wall, and its lush large leaves are such a tropical addition to the landscape. 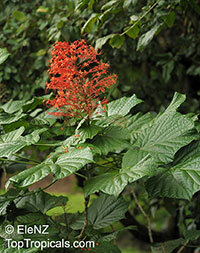 Highly recommended for shaded locations that can use both color and green.